These Wine Braised Short Ribs fall right off the bone. Braised in a dutch oven and served with creamy mashed potatoes with white cheddar cheese! This post contains affiliate links, which means if you buy something I’ll earn a small commission at no additional cost to you. 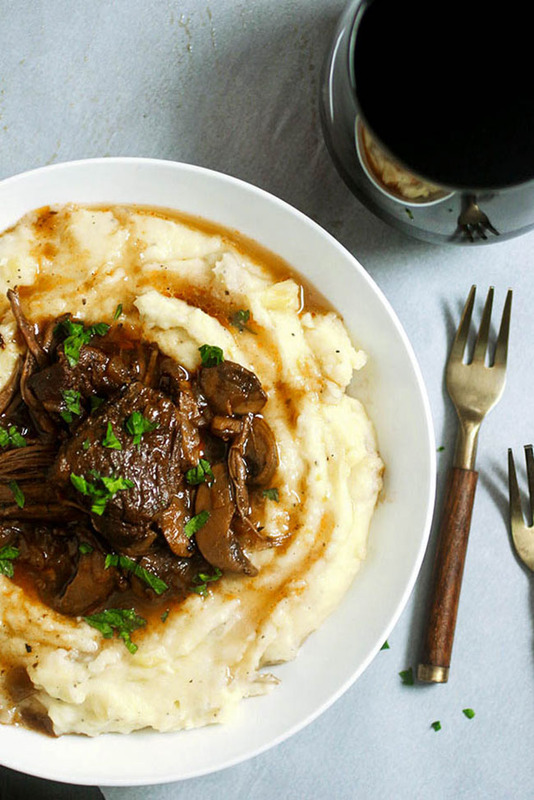 ‘Tis the season for braising and wine-ing and mashed potato-ing and snuggling up under a blanket to beat the cold with a bowl of warm, tasty comfort food! Braising is my faaaaaavorite way to cook short ribs – the low, slow heat in the oven and a hearty red wine help beef short ribs develop SO much flavor and achieve the ultimate melt-in-your-mouth texture. 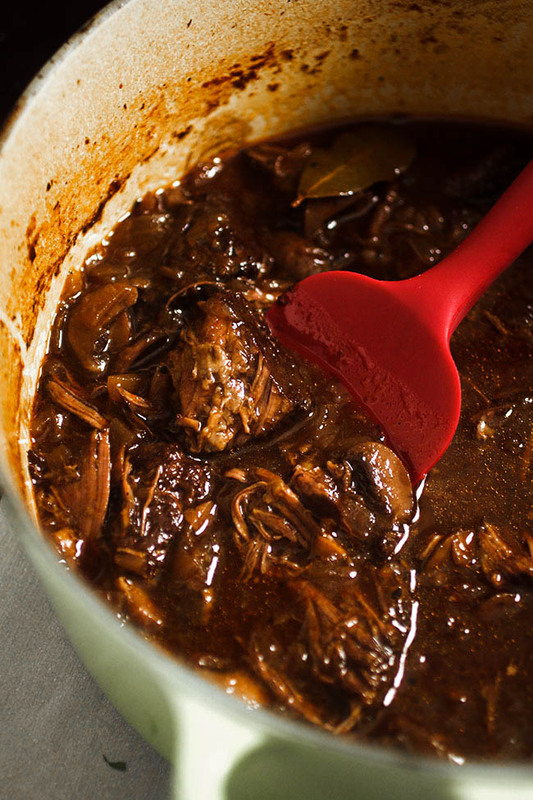 If you haven’t tried braising before, I promise that it’s easier than you might think! Season and sear the short ribs, then set them aside for a minute. Cook some garlic and onion up in your favorite Dutch Oven, add some mushrooms, tomato paste, and a few glugs of tasty red wine. Throw the short ribs back in the pot, cover it up, and pop it in the oven to braise for a few hours until they’re soft and tender. And also until your entire house smells TOTALLY AMAZING. 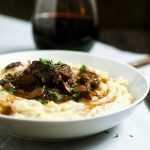 I paired these beef short ribs with my favorite white cheddar mashed potatoes, but you can use any side dishes you like! We LOVE mashed potatoes, and we don’t eat a whole lot of meat, so this recipe makes a lot of potatoes and just enough meat for a small portion. 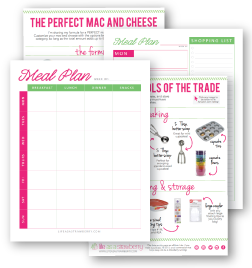 Double or halve the recipes to suit your own tastes! Braising is a very forgiving process, so this recipe will hold up well to most adjustments. 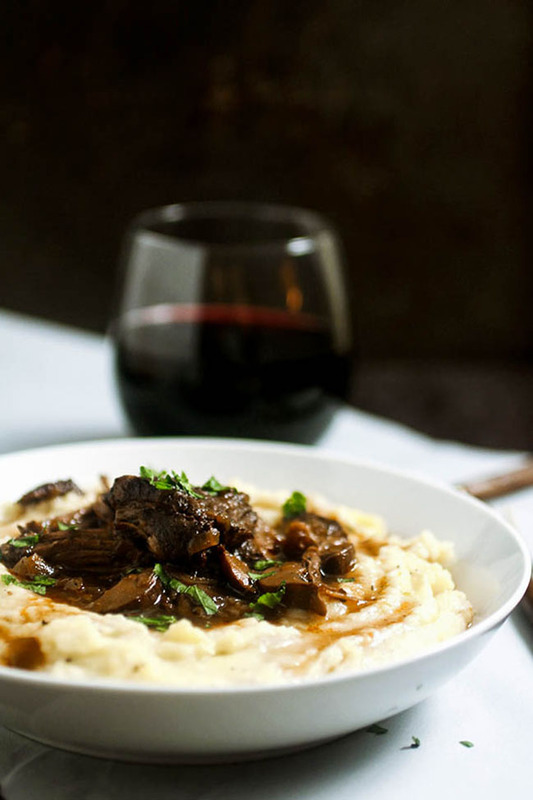 Hearty red wine braised short ribs and creamy white cheddar mashed potatoes. Heat olive oil on the stovetop in a dutch oven (I love my Le Creuset) over medium heat. Generously season all sides of the short ribs with salt and pepper. Add short ribs to hot oil and sear for 2-3 minutes on each side until short ribs are nice and browned on the outside. Return dutch oven to burner and add onion and garlic. If the pan looks too dry, add another splash of olive oil. Sauté 2-3 minutes until onion is translucent. Add mushrooms to dutch oven and stir to combine. Cook 5-7 minutes more, until mushrooms have reduced and onions have begun to caramelize. Add red wine to dutch oven to deglaze. Make sure to scrape any browned bits off the bottom of the pan with a wooden spoon! Add bay leaves and water to pot and stir to combine. Bring the mixture up to a low simmer, then remove from heat. Add short ribs back to the dutch oven, nestling them in with the onions and mushrooms. Cover dutch oven and place in 225 degree oven. Bake for 3-4 hours until short ribs easily pull apart with a fork or spatula. Remove short ribs from oven and let cool for 10-15 minutes. Skim off any fat that’s risen to the top. If the broth looks too watery, you can bring it to a simmer over medium heat on the stovetop and cook it until it’s reduced to a consistency you like. Use a pair of tongs or a fork to pull short ribs into smaller pieces. Remove any bones and the bay leaves from the pot, and serve short ribs immediately over White Cheddar Mashed Potatoes (recipe below). Garnish with a bit of fresh chopped parsley if desired. Cook potatoes in very salty water until they are easily pierced with a fork, about 30-45 minutes. Add butter, salt, pepper, milk, and cream to potatoes and mash with a potato masher. Add shredded cheddar cheese and stir until cheese has melted fully into the mashed potatoes. Taste and add seasoning if necessary. If the potatoes taste dry at all, add another splash of milk or a little more butter. 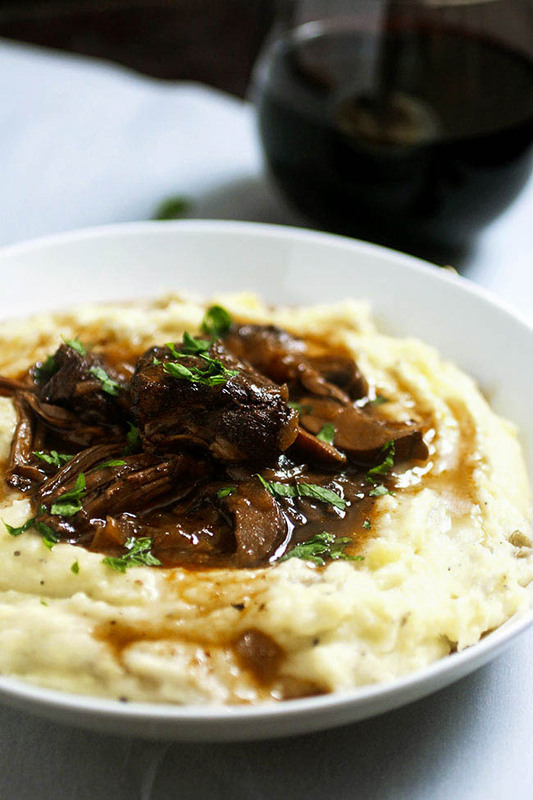 Top mashed potatoes with wine braised short ribs and serve immediately. Make sure you cut your potatoes into consistently-sized pieces so they cook at the same rate! We’re big potato fans in my house, so this recipe makes a fairly large batch of mashed potatoes – if you’d like smaller portions, just halve the mashed potato recipe! We eat small portions of meat – if you want more meat per person, you can double the short ribs recipe. Serve with your favorite roasted vegetables or a hearty salad for a full meal. Hi – If I’m preparing this for a dinner party for 6 people and do not have a dutch oven large enough can I use a roasting pan for the oven and wrap foil tightly around the pan? Would it be possible to make this in an Instapot? I currently don’t have a dutch oven. Oh my goodness was this ever delicious! My family couldn’t enough of it. Thank you for a fabulous dish! Hi Karen, you’re welcome! So glad the family enjoyed it! Hi Deb, thank you for the review. Can you recommend a particular brand of pinot noir to use, for a non-wine drinker?? Thanks! So good! Have made this several times and love it. So flavorful! Any recommendations for someone who isn’t a fan of mushrooms? Sounds so good, but I don’t want to throw the proportions off if I don’t use them. Thanks! Use anything you like! Extra onions or leeks, carrots, potatoes, butternut squash or pumpkin – this recipe is very forgiving, so you can play around with it pretty easily! If you use softer veggies, like zucchini or carrots, that don’t need a lot of time to cook, you can always add them right at the end so they don’t get mushy. Hope that helps! This was delicious! 1.5 lbs of short ribs was the perfect amount for my husband and me. I left out the mushrooms because neither of us is a mushroom person. I made the full 3 lbs of potatoes cuz I’m never opposed to leftovers 🙂 I might use them to make my husband a shepherd’s pie. I’m so happy you liked it! Thanks for letting me know how it turned out! Could the short ribs be made a day ahead? Definitely! Just let them cool completely before you put them in the fridge. Sometimes I actually leave them in the dutch oven and put the whole thing in the fridge, then pop the whole thing in the oven to heat it through when we’re ready to eat the next day! I love braised short ribs but I’ve never made them as I always felt it was out of my league! LOL But I’m going to try this one, you have given my that boost of confidence I needed to try it on my own. I even purchased my first dutch oven today for the occasion. I do have one questions to ask regarding the recipe. What do you think about replacing the water with Beef Broth? I want a little thicker gravy and I thought it might add even more flavor to a fab recipe. Please tell me what you think I want to try it tonight. I have boneless short ribs. Is that ok? Yup, that will work fine! Question…did you trim the short ribs before cooking? Looking forward to trying this recipe! I didn’t trim them myself, but I have a great butcher who takes care of a lot of that for me! I do generally leave a bit of fat on the short ribs – it will cook down a bit when you initially sear them and then the remaining fat will add a ton of flavor to the sauce. When the short ribs are done, just skim any excess fat off the top of the sauce and enjoy! Can you use pork short ribs? I wondering why you state 1.5 lb short ribs…that’s less than one pack of 3 ribs with bones. Are you sure about the amount? I tend to buy short ribs direct from our butcher, so I’m not sure if that corresponds to a standard “pack,” but yes, I used 1.5 lbs. for this recipe. We eat very little red meat so this was plenty for us. Feel free to double the recipe if you’d like more! ok Thanks for your fast reply and yes I will do that. Can’t wait to try the mashed potatoes ! Could this be converted to a crock pot recipe? You could certainly do the bulk of the short ribs cooking in the crock pot if you like – I’d still recommend searing the meat, though, since it helps the fat render and gives it a ton of flavor! You may also need to make adjustments to the amount of liquid/cooking time if you’re cooking it in a crock pot – just keep an eye on it and use your best judgment. The mashed potatoes I’d probably recommend making on the stovetop. I made this yesterday. My first attempt at short ribs and it came out great. Much easier than I thought it would be! But I’m wondering if the amount of potatoes is correct – 3 lbs made way too much for the amount of ribs. And curious as to buying short ribs…while mine fell off the bone and tasted great, I had big hunks of fat that never cooked off. Should I have trimmed them before cooking, or should I try to buy a better cut of them? I’m so glad you liked it! Yes, the amount of potatoes is correct – once we trim and clean them, we generally lose a bit of that weight, and we’re also just big potato fans in my house so I tend to make a pretty big batch (plus, we love the leftovers). I can add a note to the recipe in case anyone else wants to make a smaller batch. As for the short ribs, because they’re such a fatty cut of meat you do occasionally end up with fatty pieces (some people like to eat those pieces, but I’m not one of them – I tend to just pull any membrane-like pieces out of the pot and discard them before serving). I tend not to trim the fat before cooking because it gives the dish so much more flavor – but you could definitely search for a leaner cut next time you’re at the store! The other solution would be to let the meat braise a little longer – if all the fat hasn’t cooked off yet, another hour or so in the oven can help that fat render so you can avoid those big chunks. I hope that helps – thanks for letting me know how the recipe turned out! Oh my goodness! That succulent meat! The creamy mashed potatoes! Whoa..